The total derivative of a scalar function of two independent variables (x,y) is the result of combining the idea of the vector gradient of the scalar function with an infinitesimal position vector. The position vector defines an infinitesimal distance that seperates two points, A and B, see Fig. 1 below. Both the gradient of the scalar function and the position vector coexist in the two dimensional x-y plane by definition as shown in Fig. 1. The total derivative is defined as the vector dot product of the position vector with the vector gradient of the scalar function, f(x,y). 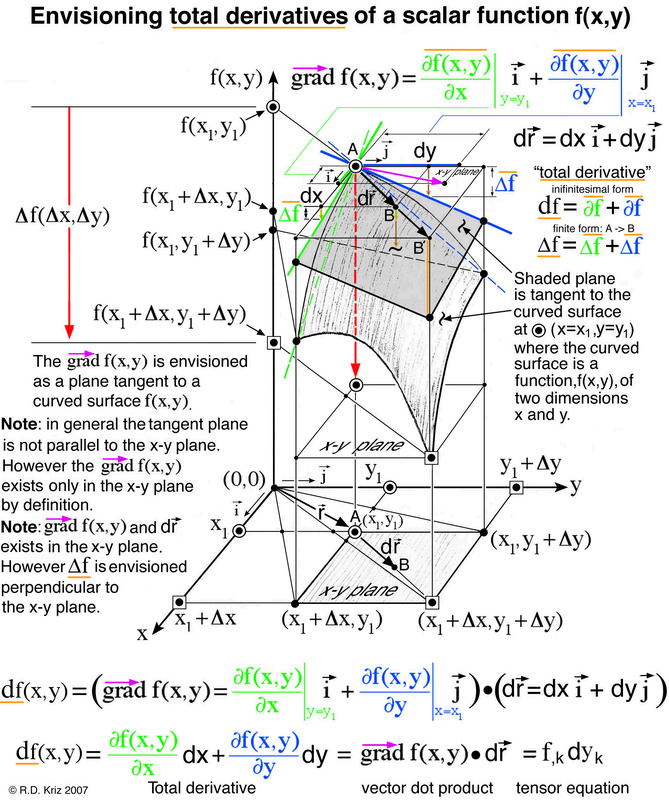 Hence the total derivative is a scalar quantity that exists in the x-y plane but is not envisioned in the x-y plane. The objective here is to envision the total derivative as a small change in the scalar function associated with the total derivative. It is common to envision the change in the scalar function as a curved surface above the x-y plane. However changes in the scalar function at discrete points within the x-y plane, which map out a curved surface, is not the same as the difference of the scalar function associated with the total derivative. The contents of this web site are © Copyright Ronald D. Kriz. You may print or save an electronic copy of parts of this web site for your own personal use. If used elsewhere in published or unpublished form please cite as, "private communication, R.D. Kriz" and include link to this web address. Permission must be sought for any other use.